Strategic pairing can improve both cards’ sales appeal. Eric Froehlich’s Naya Zoo deck was composed of 83% rare or mythic cards, making his deck a perfect example of how expensive it is to be a tier 1 competitor. Most of the cards he used are expensive from the perspective of most casual players, but not so expensive that they could not afford a few if they really wanted ‘em. It is certainly obvious that most casual players will not be playing decks composed so expensively as Froehlich’s. Despite this fact, many MTG retailers stock their singles space with mythic and chase rares that sell for at least $10 each. The problem here is that this makes the majority of the inventory held by retailers geared toward a minority of the market; it means that there is just no way that they are all going to sell, and that many cards will be left sitting on shelves not producing profit. So, the question becomes, “How do magic card retailers gear their inventory toward a larger portion of the market? And how do they clear the inventory of mythic and chase rares that they already have?” By giving the average player a reason to buy expensive cards. Casual players will not be filling their decks with high-priced cards. The only expensive cards that these players will be buying are those which work best with more affordable cards. As you may know, pretty much all of the chase rares work extremely well with less expensive cards. The problem is that not everyone else does, and the solution is proper organization of trade/sell binders. For example, a casual player opening a binder is likely to see the first few pages packed with chase rares that he already knows he cannot afford, and, having no reason to buy, flips right past them without even stopping to give them consideration. On the other hand, the casual player may open a binder and see a combo build with cards that he most certainly can afford or may already have. 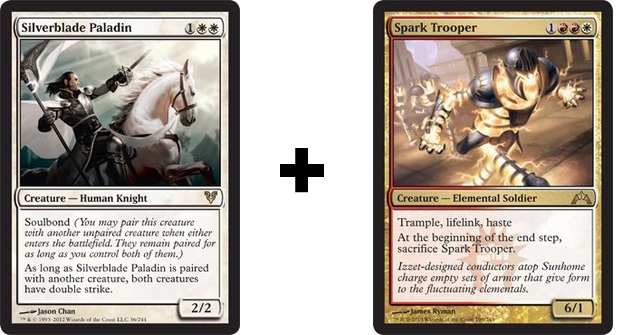 Let’s say your customer has some Spark Troopers, Cloudshifts, or Duskmantle Guildmages laying around in his extras not really being used; then, he opens your binder and sees a Thragtusk that he doesn’t want to pay for, but instead of being surrounded by other cards that aren’t in his buy range – it’s sitting there, right next to a card he can afford: Cloudshift. Hell, he probably already has a playset. It’s a simple, game changing combo that just fell into his lap. The Thragtusk will immediately become more appealing to the customer, and every other customer who looks at that Thragtusk and realizes the potential power it has if used with a card they already own. It’s the same concept a car salesmen will use when selling an expensive car; but, instead of just being a car – it’s leather upholstery, tinted windows, and all the things that contribute to the desire and/or impulse of owning such a luxurious object. In other words – organizing your trade stock in a way that allows customers to realize the potential benefits of chase-rares, in conjunction with easily affordable cards, will increase the appeal of otherwise difficult to sell cards. Instead of letting chase rares sit on shelves, doing nothing other than being drooled at by the occasional customer shuffling by, retailers should be reorganizing their binders and cases in such a fashion that these chase rares become more appealing to customers. So, you get it – now go out there – put the rubber to the road and make some extra cash! This will conclude my third installment, thank you all for reading. Hello everybody and thank you for tuning into this week’s edition of Money Ramp! January 26th marked the beginning Gatecrash’s pre-release, which began as early as 12 am Saturday (Jan 26th), and went as long as 11 pm Sunday (Jan 27th). 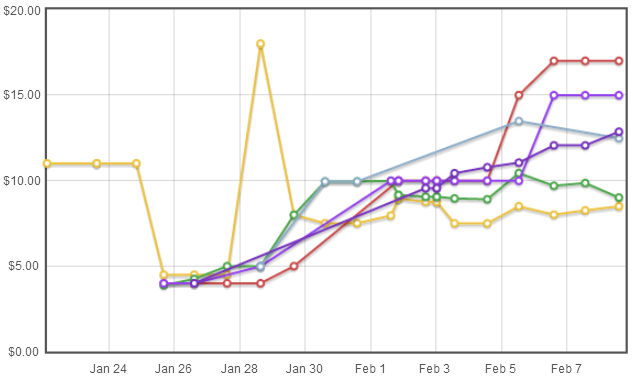 Many card prices remained the same before and after the pre-release; some even depreciated and are still trending down (Aurelia’s Fury). However, for power-traders like myself, there was a light at the end of the tunnel during the weekend’s course of price alteration: it was Boros Reckoner! Now, I attended pre-release, but did not play – instead, I bought my sealed guild-box, dropped, and ran the retail booth for my LGS. However, I had the opportunity to walk around our event and observe a few game-states. During the time I spent watching others play, a few cards immediately stuck out to me as cute “win more” cards, such as Biomass Mutation; whereas others stood alone as “win well” cards, such as Aurelia, the Warleader and Boros Reckoner. Since the release of Gatecrash, it’s of no surprise to me that both of these cards have scaled in price, with Boros Reckoner simply soaring! As you can logically assume, the experiences players had with Boros Reckoner during pre-release weekend greatly influenced his demand, and thus his price; on the 26th of January, Boros Reckoner’s average price was $4.20; his average price on January 31st was $10.20 – an increase of 243%! 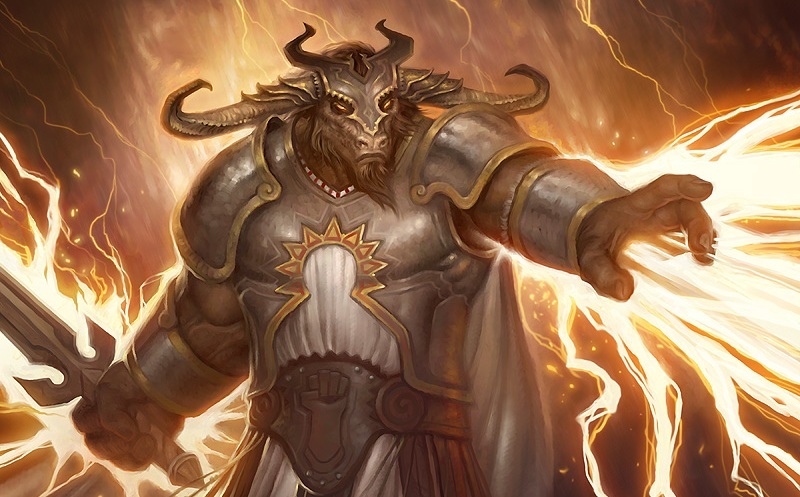 In closing, I presume it’s safe to assert that Boros Reckoner will be a brickhouse in standard-constructed; the demand is there, the price is there, and the power is there – but I feel that he’s found a solid home in the market in the $12-$13 range. In my previous article, I said that I would be discussing some bad investment practices that our Protrader feature can save you from making; but I’m out of time for this week, so that will be the focus of my third installment. Stay tuned! My name is Zack Alvarado, and I will be your host for the present. My first installment on MTGPrice.com will examine price increases on the current market and discuss what I believe has influenced these changes. Specifically, I will be discussing Modern format dual-lands and why they’re currently on an unavoidable uptrend. Pain Lands, such as Temple Garden, are staple picks for land slots in Modern comps (competitive deck builds) that are utilizing multi-colored spell bases: they provide an efficient mathematical dunamis – in terms of spell-casting and ability-activating potential. Paying 2-life to ensure that a vital 1-drop (such as BoP) can be played on the 1st turn, while simultaneously extending the variability of castable spells on turn two, seems very hard to argue against. Now, what about Filter Lands from the Lorwyn-block? Five were printed in the Shadowmoor expansion, and five in the Morningtide expansion, but they haven’t received much favor until recently – why? Well firstly and foremostly, they lack a basic land type: rendering them unfetchable by cards such as Scalding Tarn and Misty Rainforest. But I digress, are 8-12 Pain Lands necessary for efficient mana-fixing? – Especially in conjunction with 4-6 Fetch Lands? – I don’t think so – and neither do some of the currently best players. Lorzeno Calzolari, who recently reached the top-8 of Grand Prix Bilboa, was asked what changes he would make to his deck after the tournament; he replied by saying, “I swapped a Cascade Bluffs for an Island at the last minute. I wouldn’t change anything else.” (staff). Calzolari wasn’t the only top-8 player at Wizard’s GP Bilboa this weekend to include Filter Lands in his build; 5 of the top 8 decks were utilizing Filter Lands this weekend. Why? Well, perhaps they agree that there is a point where a deck can have too many Pain Lands and Fetch Lands – freeing up a few slots for Filter Lands and the strong mana fixing they provide at the cost of 0 life. Let’s look at the increasing prices of Filter Lands at Starcitygames.com, via www.mtgprice.com – simply because they have the least price flux, as opposed to TCGplayer.com; and the most stable inventory, as opposed to Ebay.com. Now, I use the ProTrader features from MTGPrice to access my data – so your charts won’t go back as far as mine unless you’re a ProTrader as well. However, if you look at the price-spikes after my tweet on December 22nd, and prices at Jan 22nd, 2013: you’ll understand that the database offers unprecedented reports of the MTG market that can assist traders in predicting uptrending and downtrending volatility. Here are the price fluxes of Filter Lands between May 19th (the date that Modern format was announced) and Jan 22nd, 2013. So all in all, it is apparent that these cards have skyrocketed since Modern became ‘a thing’: the 10 Filter Lands have collectively averaged a price increase of $6.25! Their collective average price in May was $7.50! Stay tuned for my second article to drop next week – I’ll be revealing some premature uptrends and discussing bad investment practices that ProTrader features can save you from making!